2 Piece Sticky Roller Set - Washable And Reusable. This set is the perfect choice for anyone that wants to start removing hair and lint without working too hard, wasting money, or worrying about purchasing refills. You get one regular size reusable sticky roller, and one travel size. They are both powerful tools, and each will allow you to remove fuzz, fur and other light debris from clothing, furniture, bedding, flooring and more. Instead of running to the store for a new one, or purchasing a refill, you can simply rinse the grime down the drain to keep on using them over and over again. Each roller is super sticky, so they act like a magnet for dirt. Simply roll the tool over the surface you are cleaning to completely remove all of the yuckiness. It will immediately cling to the roller and be locked on until you are ready to dispose of it. Once the job is done, or the material is fully coated, simply rinse under warm water to wash away all of that hair or lint you just picked up. After the roller is thoroughly rinsed, let it dry, and it will return to new condition all over again. Looking for one with an extension pole? Check out our 3 piece set. It has both of the ones featured here, but it also has a larger one with more surface area, and a telescoping pole. You can also order each tool individually, so if you only want one or the other, then follow these links: mini roller, regular roller, or large roller. 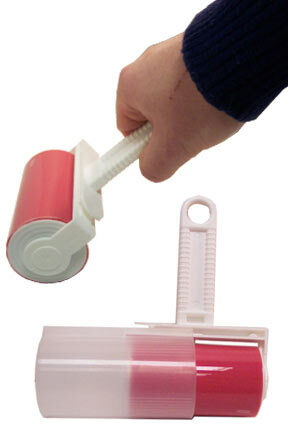 If you prefer a large washable roller without a long pole, then check out our Large Handheld Sticky Roller. The head is the same size as our other large version, but the handle is more compact in comparison. Better Quality. Sift through the knock-offs and cross your fingers, or order from us to guarantee results. Better materials and years of customer feedback ensure that these are higher quality than similar looking alternatives. Easy To Store. Both of these stay clean and undamaged when your not using them. The larger one has a slip on cover, and the smaller one folds to cover itself. Washable. Save money and add convenience. With no refills to buy ever, this is a cheaper option that offers the same cleaning ability. Super Sticky. The clingy surface attracts dirt like a magnet. With proper maintenance, it will stay the same for many years of regular use. Portable. Small enough to take with you, but large enough to get the job done quickly. Use all over your home, or use when on the go. Before you start, check the pink portion for any residual dirt. If coated with grime, rinse or wash. If coated with moisture, dry before use. For the regular size tool, remove the storage sheath prior to cleaning. For the travel size tool, unfold to open and use. Clean by rolling over any light debris. Use a forward and backward motion with the larger one, and a side to side motion with the smaller one. Once finished, or once fully covered with dirt, rinse under warm water to release it, and wash it down the drain. Replace storage cover, or fold closed when finished. If the sticky starts to go away, a thorough cleaning with soap and water or rubbing alcohol is all you need to bring them back to new condition and make the roller just as sticky as ever. Because loss of effectiveness is usually due to coating with residue or fine particles, a good cleaning will remove this stuff from the surface to make the roller like it was when you first used it. The regular size roller is the perfect all around tool, and it can be used all over your home, office or vehicle for many applications. Take pet hair off the seat in your car, or quickly clean the bathroom floor. Use it before work in the morning to take lint, hair and other fuzz off you suit before you walk out the door. Does your pet like to sleep on your couch? Use this one to quickly remove all of the shedding before you sit down. It can easily be tossed in a closet or in a drawer when you don't need it, and thanks to the included cover, you know it will be clean and ridiculously sticky when you do. The mini size is all about convenience. When opened up, it reveals a decent sized roller that will pick up a nice amount of debris, but when folded down it becomes very compact. It's the perfect way to stay lint and fur free anytime you are away from home. Keep one at the office to always look your best, or slip one in your glove compartment to take care of anything that pops up as you go about your day. It is small enough to go in your pocket, and makes the perfect addition to your luggage or carry on. Because it collapses into a nice compact package, you will be able to slip it into your purse or pocket, or toss it into your glove box or desk drawer. There is no chance of it getting dirty when closed up, so you can take it with you to clean off dog hair or lint at any time. These sticky rollers will outperform traditional versions in their ability to clean and remove debris, but unlike those regular kinds, these will not wear out, or run out of stickiness. You will never have to buy new sheets of sticky paper, and you won't find yourself tossing these out in order to use replacements. They will remain usable for many years, so they will save you time and money when compared to using a traditional tool. Because you are not tearing off sheets, or tossing out old rollers, you will also be doing your part to help the environment. Don't be fooled by cheaper knock offs that won't last as long, or produce the same style results. This high quality set is sure to work as intended, and will last for years of use. 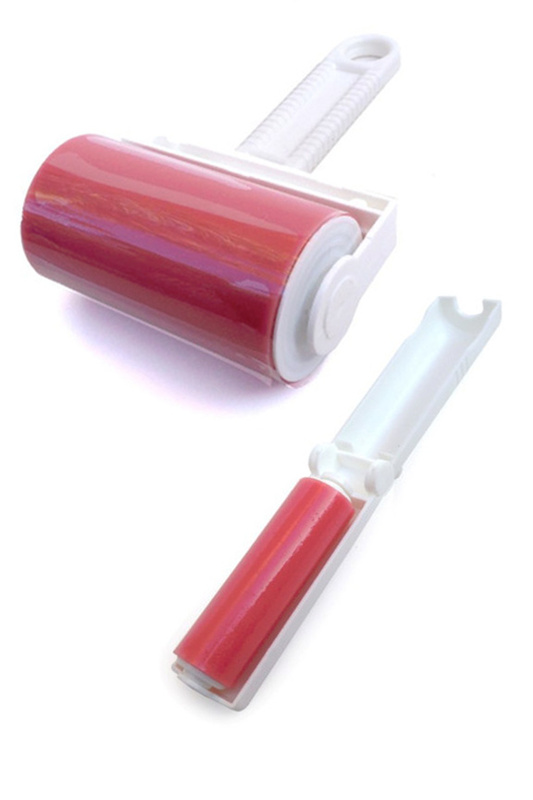 Regular Roller Size 4" x 2.25"
Two Piece Sticky Roller Set - Order the two most popular rollers at an incredibly low price. Easily remove lint and hair from any surface. Great for clothing, furniture, floors, drapery, your car and more. Just rinse with warm water and use it over and over. Stop using disposable rollers and wasting money on refills. Order Yours Today. I needed a substitute for rolls of sticky paper. I was happy I found these. Oddly enough after a few uses, the sticky was gone. Oh they worked while it lasted but to clean it off you have to run it under water. Maybe I should not have used hot water because the sticky was gone. Well I guess I will learn as I use them. Good but needs improvement. I have to wear black shirt and pants for work, so I am constantly having to remove lint. I was using the tape lint removers. The tape was getting expensive and I had piles of debris. I got the lint rollers as a gift and I can't imagine life without them. I use the large one at home and carry the small one in my purse for quick touch ups at work. They are well made, there is no extra expense, no piles of debris. I just rinse of the lint and they are ready to use again. The item does the job that it was bought for, removing threads from quilts. When rinsing the roller, water is retained in the cylinder. This could be resolved by a few holes in the cylinder to release the water. What Was I Thinking !! ??? !! ?? In my quest to find an alternative to paper stickie rollers, I bought this set only to realize I could only use it ONCE and then had to use WATER to wash it off and THAT was not easy and took way too much water, and and and .. a ridiculous idea these things. This doesn't work as good a regular lint roller. The stickiness is not good, and the lints don't come out well. And than one has to wash it and dry it every time. Drying it is also problematic as I can't wipe the moisture off. 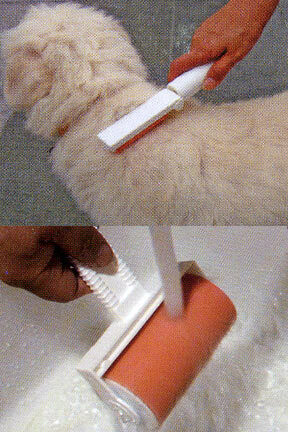 Wiping makes some new lint stick to the roller from the fabric/tissue. 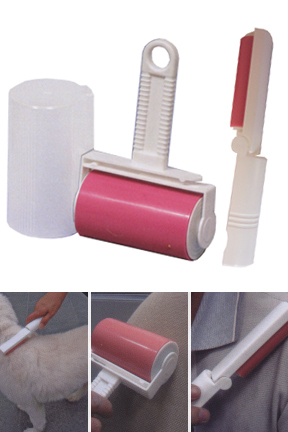 We Love the Sticky Roller, works as described. We have 4 cats so this has been an invaluble item in our house. Service was good and speedy delivery! Thank you!! This product is great! It does exactly what I need it to do. And the fact that its reusable makes me so happy. I hate those paper rollers. I'd recommend this product and site to anyone. Thank you! this is better than I expected. even after using several times it's till sticky and clean very well. Purchased the Schticky (blue). The first time I used it, great. Rinsed & dried according to directions had a little discoloration. Used it a second time. This time after it dried it looks extremely dirty in color. Went to use it a third time and after one roll across the shirt, it was done being schticky. The first time is great and it seams to degrade after. I purchase the 3 pack, mini for travel, regular size and the long handles one. simplygoodstuff response: Well. You said it all. You did not buy this product. You bought something that looks the same. Unfortunately, not all rollers are created equal, and it is very easy to find an inferior version. Ours works incredibly well, and stay super sticky for years. Thank you for helping other people avoid those blue versions, and any other impostor with the same pink color. Tried them out right away and happy to say they work GREAT. Tired of cat hair all over our clothing, so this seems to be a good solution. We have 3 cats and 1 dog and these work great on the chairs, the couch, my bed and of course on clothing.I even bought a set for a friend who has animal allergies. Travel Size Lint Roller. Use. Rinse. Re-use.